Peal and cut the sweet potato into 1/4-inch slices. Preheat the oven to 425°F. Bake for 20 minutes or until the slices are browned and cooked and you can easily poke with a fork. Let cool for 15 minutes. Stir the yogurt and season with salt and pepper, as well as the chopped dill if you like. Place 1 teaspoon of yogurt over each slice of sweet potato, add a piece of salmon and 1/4 teaspoon of yogurt. Decorate with the capers or dill. You can do the same with chives and roast beef or cheeses seasoned with pepper or garlic and ham. The natural sweetness of the sweet potato will highlight the flavor of the meat you use. During this season of parties and family reunions, I always like to create snacks or hand-held appetizers for everyone to enjoy. 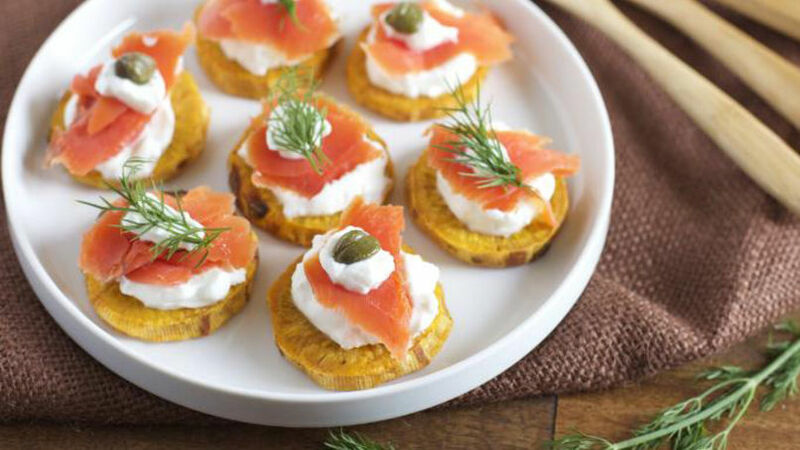 Sweet potatoes have been very well priced this year, so I decided to try this combination with smoked salmon and dill, but you can add whatever you like to these slices of sweet potato. It's a much more nutritious option than bread or regular chips.